Well, I worked on it, so why WOULDN’T it be? To wit: The Lincoln Center Theater revival of The King and I will come to movie theaters this fall. Following its Tony-winning run at the Lincoln Center and a national tour, The King and I is currently playing at the London Palladium in London’s West End in a production featuring its three original leads, Kelli O’Hara, Ken Watanabe, and Ruthie Ann Miles. That production will be released in cinemas this fall by Trafalgar Releasing. 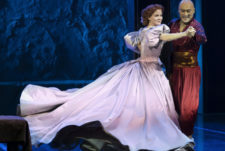 The King and I: From the Palladium will come to U.S. movie theaters for two nights only, Friday, Nov. 29 and Tuesday, Dec. 4. Even Barbara Cook Was There! Ruthie Wins Outer Critics Award!